ManUtd.com is delighted to announce Angel Di Maria will wear Manchester United's no.7 shirt, one of the most iconic jerseys in world football. The summer signing from Real Madrid joins an elite club of players who have excelled in the shirt, which has been vacant since Antonio Valencia reverted to no.25 last summer. "I am aware of its importance," Di Maria said on Thursday. "Cristiano Ronaldo spoke to me at Real Madrid and explained how important it is. I want to wear the shirt and do as much as I can for the club, like Ronaldo did. 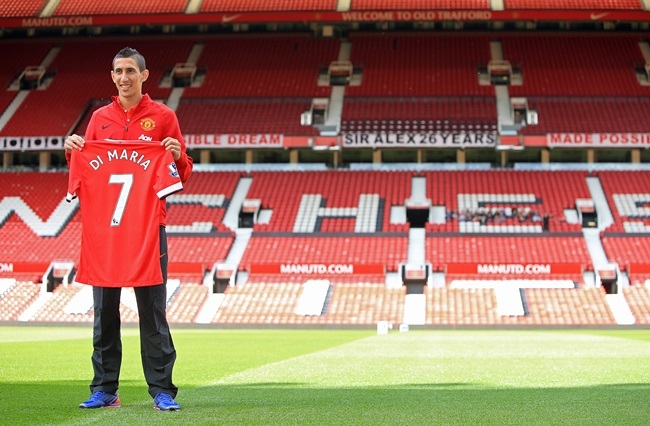 The club also wanted me to wear the no.7 shirt and I hope I can live up to it." The shirt's legend can be traced back to George Best and the Northern Irishman's historic career at Old Trafford. Since then, it has adorned the backs of Bryan Robson, Eric Cantona, David Beckham and Di Maria's former team-mate Cristiano Ronaldo. Michael Owen inherited the no.7 shirt during his two-season career with the Reds – and wore it to score a historic Manchester derby winner at Old Trafford – before Valencia took it on for just one term in 2012/13.